I have a Mac Pro 2008 computer which has been very good. I’ve replaced the original hard drives once already and I had to replace the graphics card a couple years ago. Recently I’ve been having issues with startup disk so I decided to replace it. However this time, I decided that with the price of Solid State Drive’s (SSD) coming down and reasonable, that it was worth spending a little extra compared to getting a regular hard drive. After all, this was for my startup disk with the operating system and applications on it. Running off an SSD would provide a significant speed boost. I researched what it would take to make this happen and it’s actually quite simple from a hardware perspective. Option 1: This is the cheaper method. You need to buy an SSD and a drive caddy to install into you computer. Below is an image of a caddy and SSD ready to be mounted. 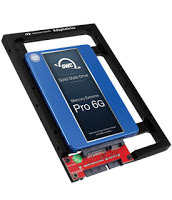 The one issue with this option is that most SSD’s sold now use SATA that runs at 6Gb/s. That’s great, however the Mac pro hardware only runs SATA at 3Gb/s. So you’re paying for extra speed you can’t use. Option 2: This option costs $27 more than the first option but you get speed boost. I bought an Other World Computing (OWC) bundle that included a Mercury Extreme® Pro 6G SSD and an Accelsior S dual-lane PCIe 2.0 card. Other options for the Mac Pro 2008 are available here. Installation should have been smooth and easy. For the hardware it was. That took a couple of minutes. 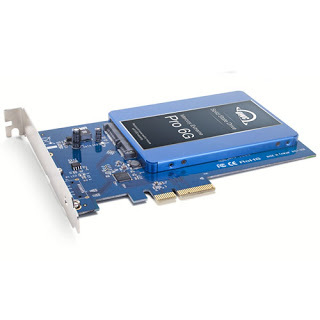 Instructions on how to add the OWC PCIe 2.0 card with SSD mounted is straight forward. 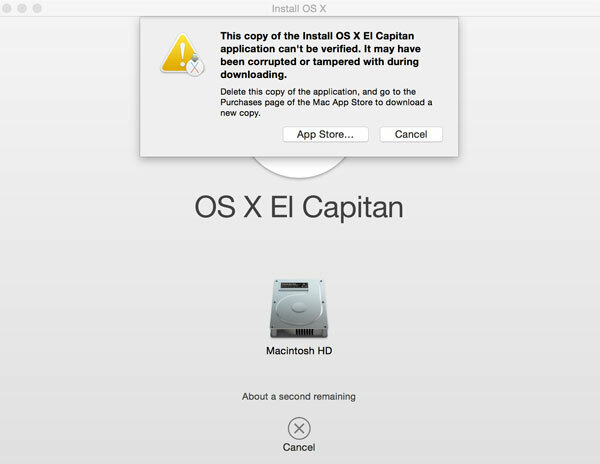 Installing OS X El Capitan was not so smooth. A warning. I expect if you’re following along you have some idea of what you’re doing. Such as don’t erase your current startup disk etc. You’ll need to download El Capitan from the App Store. You’ll then need to create a bootable installer with El Capitan on it. I used a USB flash drive. 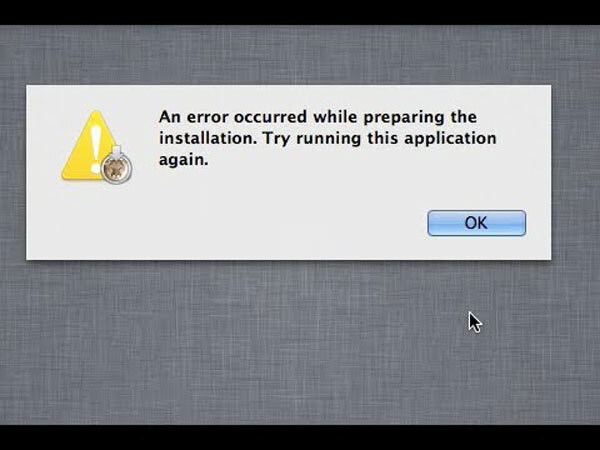 Instructions from Apple to create the installer are here. Once you have your bootable installer and you’ve installed your SSD into your Mac you’re ready to proceed. Assuming your computer is not on, insert the USB flash drive into a USB slot on the computer and start the computer. Make sure you are holding down the Option on the keyboard so that your computer boots from the USB flash drive and not your current startup disk. Once the OS X El Capitan installer shows up on your screen you’ll need to format your new SSD drive. Click the Disk Utilities option and select Erase. This will format the new drive. type in a name for the drive, it could be Macintosh SSD or anything you like. The other options should be pre-selected for you, Mac OS Extended (Journaled) and the Partition GUID. Once that’s done exit Disk Utilities and select Install OS X. It will take a few or several minutes to install before it gets says it will now reboot. This is where people usually encounter problems, as I did. See the both error screens I received below. You can search the internet for answers to the first error, the most common cause seems to be an incorrect system date. That’s easy enough to fix and it worked for many people. It didn’t work for me. The second error is more generic, just try again and it might work. I gave up trying and started thinking about an alternative plan, Plan B! For Plan B I decided to install a new 1TB hard drive and do a fresh install on that drive. I had no issues!! I just inserted a new hard drive into slot 1 on the computer, rebooted and installed OS X. Now with a fresh install of OS X El Capitan I checked to see if there was an update to the OS in the App Store. There was a minor update, so I installed it. I had also noticed that my system hardware had my time zone set as PDT. I bought the computer when I lived in Vancouver. I’m now on EDT time however. So I changed the time zone to EDT. With the fresh install I decided to try installing OS X El Capitan on my SSD again. And this time, voila, it worked like a charm. Did changing the time zone do the trick? Maybe. Previously in earlier attempts in the day I had changed the time but not the time zone. In any event, I have an inexpensive upgrade completed. I’m running a clean install of OS X and the computer boots in under 30 seconds and my apps load lightning fast. So unless my hardware fails I should get at least 2-3 years more out of this computer I bought in 2008.